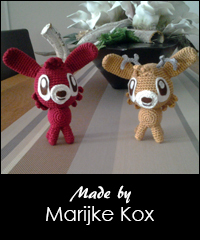 When I saw the deers Flo and Fau, designed by Daieny Schuttz, I immediately fell in love. For this project I tried a different type of cotton yarn named Carina. It is very nice yarn to work with and can be combined with the yarn I normally use.